The Stem Cell Therapy cream is the rejuvenating, anti-aging system from BioLogic Solutions which can help your skin become younger and smoother. It works by aiding your skin to actively produce fresh new healhty skin cells. The stem cells in your skin already does this but after you turn 30, the process starts to slow down more and more, leading to wrinkles and fine lines. Using the Stem Cell Therapy cream can help awaken your skin’s stem cells again so they generate more new skin cells, like when you were young. With your skin producing more new healthy skin cells, it can help naturally smooth out fine lines and wrinkles to make you look years younger. Stem Cell Therapy cream is recommended by dermatologist Dr. Lewis M. Feder, who was recently voted as one of the Top 100 Cosmetic Surgeons in the world by the International Academy of Cosmetic Surgery. The ingredients used in Stem Cell Therapy have been clinically proven to aid the production of new skin cells. It can increase the production of fresh skin cells by up to 57% within 2 weeks with usage. Normally a single jar of Stem Cell Therapy sells for $49.95 plus the cost shipping and handling but right now there is a buy 1 get 1 free offer which is available. You’ll get a second jar with your order for absolutely free with no extra charges. 20 Comments on "Stem Cell Therapy"
Is the second jar of Stem Cell Therapy cream really free or do you have to pay more shipping for it like with many other as seen on tv products? The second jar of Stem Cell Therapy is free with no additional shipping. This is a good product. Of course you shouldn’t expect results instantly but over time it does help gradually smooth out wrinkles and fine lines. Is this made from adult stem cells or fetal stem cells? 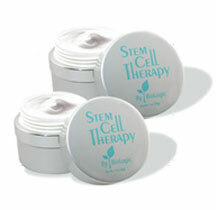 The Stem Cell Therapy Cream does not contain any stem cells inside. Rather it contains ingredients that help stimulate the stem cells that already exist inside your skin so they can produce more healthy new skin cells again to help make the skin look younger. How many ounces are in each jar? Each jar is 1 ounce. How is this any better than strivectin? What is the difference between The Stem Cell Therapy cream and Genesphere??? Does this product also work on age (brown) spots? what happened to the free product if you give a testimonial? Has this product undergone any FDA-regulated review process prior to being marketed? Even if being sold as an OTC product, I would prefer to have the FDA’s ok on it. I have been using the cream for several months anad i love it i am 70yrs. and i look 10 yrs. younger, i get compliments all the time on my skin. Can you put stem cell therapy cream on your neck? Can you please verify if the igredients and product is vegan and not animal tested? Thanks! What are the ingredients, is there any frargrances or mineral oil, I have extremely sensitive skin. will it help stretch marks? Almost finished with one jar – thinking about getting more. Will this help jowels and sagging neck? does this work on all skin types?